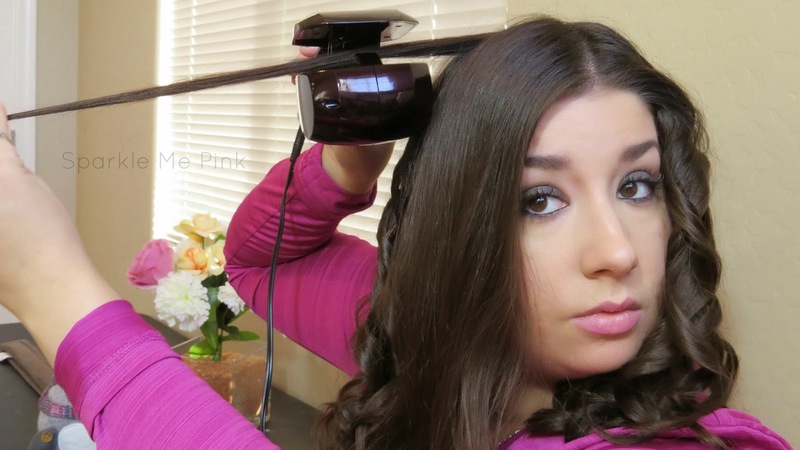 Have you seen this funky looking automatic curling iron yet ? Maybe during one of those mid night As Seen on TV marathons? 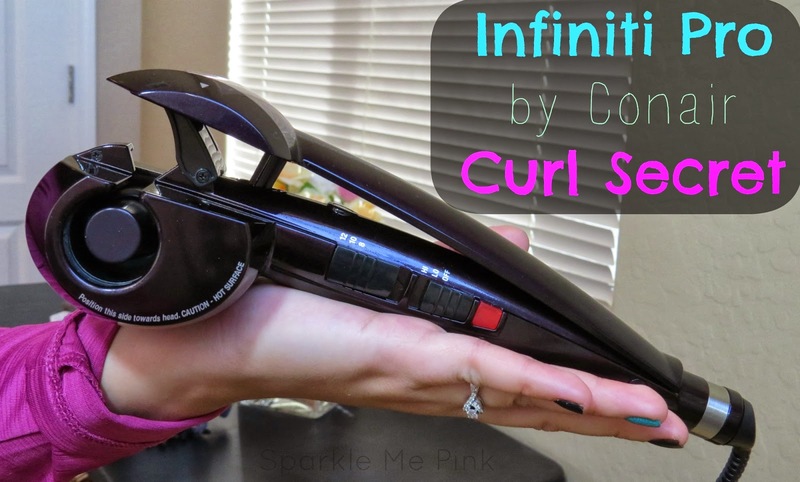 Traditionally products highlighted during infomercials are a big 'ol fail, however, this Infiniti Pro Conair Curl Secret may change your mind ! 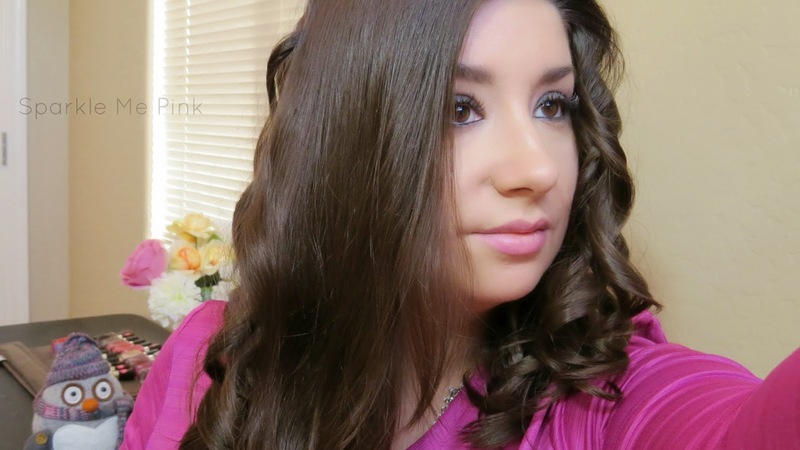 Conair Curl Secret is a revolutionary new way to create one beautiful shiny curl after another. The secret to salon quality curls is find the perfect ratio (for your hair) of heat applied to the hair as well as how long your hair is wrapped around the heat to set. 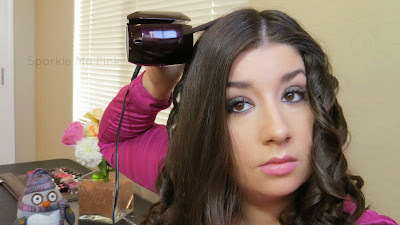 Which is why Conair's Curl Secret is equip with 2 heat settings - Low and High and 3 timer settings - 8, 10, 12 seconds ! Simply try out a few tester strands to find your perfect setting for the perfect curls. Mine is Low heat with about 10 or 12 seconds of holding time - depending on how thick of a chunk of hair I use. ( between one inch - half inch ) By the way, the highest heat setting goes up to 400°F ! Which is awesome for curling, just make sure you protect your hair. Start of by sprits-ing your clean, dry hair with a protectant spray - again make sure your hair is totally dry and tangle free before starting. Next up is to section off your hair. This will make curling a breeze since you wont be digging for uncurled pieces. Lay a 1 inch piece of hair across the hair guide, making sure the opening of the curl chamber is always facing toward your head. Also make the piece is easily accessible to the Curl Secret, meaning no flyaways are close by. Tip: IF and that is a big if you grab too large of a piece or maybe a flyaway decides to join the curl party late in the game the Curl Secret has Anti-tangle feature. The anti- tangle feature has been designed to immediately stop drawing the hair in and reverse to a neutral position. Simply open the handles and ease hair out of the curl chamber. Close the hair tool and watch has the hair is automatically drawn into the curl chamber and heated up to curl perfection. Depending on which time setting you have it on ( 8, 10 or 12 seconds) wait for the 4 consecutive beeps, open the handle and gentle glide the tool downwards releasing the curl. Make sure you are opening the tool back up all the way to prevent yourself from straightening the curl back out. 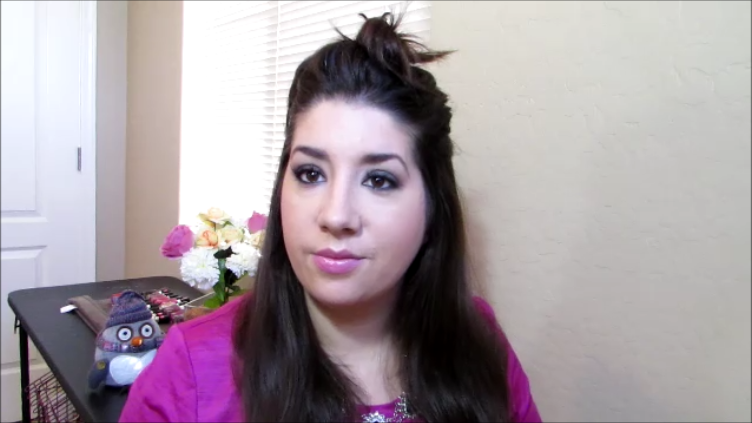 Tip: Want more of a carefree beachy hair look ? Start the Curl Secret half way down the hair instead of closer to the scalp, making for looser wavy curls ! 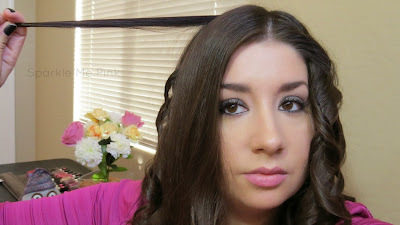 Summer over at A Mom Less Ordinary has a great tutorial on how to get Easy Beach Waves with the Curl Secret. 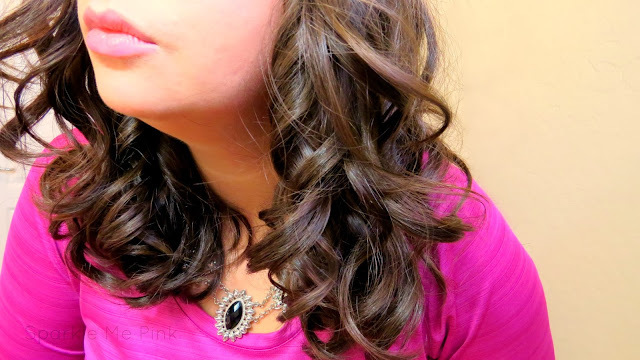 Once you release the curl, move on to the next 1 inch section of hair until the whole section is curled. Wait for theses curls to totally cool before lightly sprits-ing them with a light hold hair spray. Tip: I like to wait till my whole head is curled, cooled and lightly hair sprayed ( and dry from the hair spray) before tousling them with lightly Argan Oiled fingers. For me, the Argan Oil adds a bit of smoothing, softness and shine to my style without weighing it down. I am totally blown away with how well Curl Secret curls my hair. This automated tool takes the guess work out of how long I am actually holding my hair on the barrel as well as keeps my section sizes in check. I am finding myself making sure the sections are about 1 inch before laying them across the hair guide. Where as with other curling irons I get bored or lazy and start grabbing big 'ol chunks of hair. Later regretting my laziness because the curls would just fallout. I can say I am on second day Curl Secret hair today and my hair still has a beautiful fullness waveness to it - I am in love !!! This would be a perfect holiday gift for that hard to buy teen or heck even for yourself *wink wink* <- I totally do that go in the store to buy gifts and come out with half of it for my self hehe ... guilty ! I have seen this being sold online for about $150 on sites like buycurlsecret.com BUT Walmart has it for only $99 which is a smokin deal! This post has been compensated as part of a social shopper insights study for Collective Bias and their client. However you can always count on my reviews and result to be 100% that of my own !! "now you know my secret... curl secret" haha loved it. Great review! Cute hair! Thanks for the review! About how long does it take to curl all your hair? Thanks for the review! About how long does it take to curl all your hair? Thanks for an awesome review! This looks so easy to use! I love how it curls your hair it looks fabulous! Thanks for the review and video! This is an interesting concept, but I'm just scared that my hair would get caught in it. That would be a nightmare! I was so nervous at first too but only have ever had one little snag ( in video ) which was my fault ! Other than that I have had no issues and totally love this tool !! does this work as good as a curling iron? because I have the Karmin G3 curling iron it makes the best curls ever and they last for ages. I really love it! !